PITTSBURGH, PA, December 17, 2015—In its fourth and final announcement of 2015, the CARNEGIE HERO FUND COMMISSION today awarded 24 Carnegie Medals in recognition of civilian heroism throughout the United States and Canada. The medal is given to those who risk their lives to an extraordinary degree while saving or attempting to save the lives of others. Four of the awardees died in the performance of their heroic acts. The heroes announced today bring to 84 the number of awards made to date in 2015 and to 9,821 the total number since the Pittsburgh-based Fund’s inception in 1904. Commission Chair Mark Laskow stated that each of the awardees or their survivors will also receive a financial grant. Throughout the 111 years since the Fund was established by industrialist-philanthropist Andrew Carnegie, $37.7 million has been given in one-time grants, scholarship aid, death benefits, and continuing assistance. Cesar Andy Garcia Ronkonkoma, N.Y.
Michael Thomas Frawley Hamburg, N.Y.
Dennis C. Hunke II, deceased Plainfield, Ill.
Gary Olson Family Jefferson, S.D. Wayne L. Hoffman, deceased Spring Green, Wis.
Michael Campanella Clifton Park, N.Y.
Adam Matthew Myers Ballston Spa, N.Y.
Kevin Michael O’Connor Ottawa, Ill.
Laurence T. Norton III New Orleans, La. Clifford W. J. Peterson Ajax, Ont. Fraser A. Potts Limoges, Ont. Jon Christopher Meis Renton, Wash.
Steven A. Martin Northern Cambria, Pa.
Neil C. Burkhardt Portland, Ore.
Joshua J. Gardner Calgary, Alta. Clifford A. Wright Sarasota, Fla.
Stuart Chaffin St. Cloud, Fla.
Boyce Coleman, deceased Yonkers, N.Y.
William J. Driscoll Middleboro, Mass. Resumes of the acts follow. 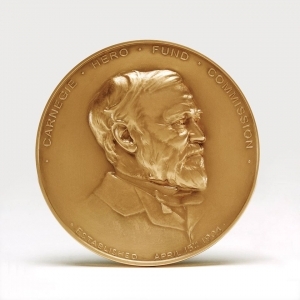 To nominate someone for the CARNEGIE MEDAL, write the Carnegie Hero Fund Commission, 436 Seventh Avenue, Suite 1101, Pittsburgh, PA 15219, or call 1-800-447-8900 (toll free). Fuller information on the CARNEGIE MEDAL and the history of the CARNEGIE HERO FUND COMMISSION can be found at carnegiehero.org. Find us on Facebook. Cesar Andy Garcia and Michael Thomas Frawley saved Robert Kehoe III and attempted to save Robert Kehoe, Jr., from drowning, Scranton, Pennsylvania, November 23, 2014. While on a late-afternoon outing at a municipal park with his father and siblings, Robert, 9, fell from a rock ledge into a deep pool of water at the base of a Roaring Brook waterfall. The pool, within a gorge, was not accessible from its steep, rocky banks. As Robert struggled to stay afloat in the 38-degree water, his father, Kehoe, 29, jumped in after him, but he too struggled. Garcia and Frawley, both 18-year-old college students, were in another party nearby. They went to a rock at the edge of the pool about 20 feet above the water, where, after removing his outer attire, Garcia jumped feet first into the pool for Robert. He swam across the pool to the boy, grasped him, and then swam toward where Kehoe was struggling. Frawley also partially disrobed and jumped feet first into the pool, for Kehoe, but Kehoe then submerged. Robert was struggling against Garcia, submerging him, and Garcia swallowed water. Frawley took Robert from Garcia, allowing him to make his way to a log at the edge of the water, where he rested. Supporting Robert, Frawley swam downstream to an accessible point on the bank and left the water, soon joined by Garcia. A hiker tended to them, giving them items of his attire, and responding firefighters threw blankets down to them. In falling darkness, they were removed, with difficulty, by first responders to the top of the gorge and then taken to the hospital for treatment, Garcia and Frawley suffering from cold exposure. They recovered. Kehoe was removed from the water later that evening. He had drowned. Dennis C. Hunke II died after attempting to rescue a woman from an out-of-control vehicle, Aurora, Illinois, October 8, 2014. An 84-year-old woman left the driver’s seat of a minivan after a minor accident on a residential street. When the minivan continued to reverse, she re-entered, but the vehicle proceeded quickly and erratically off the street and through the front yards of two properties. Standing at another property across the street, Hunke, 51, carpenter, witnessed the accident and ran to the open driver’s door of the minivan as it was moving back onto the roadway. Running alongside the vehicle, he attempted to enter it in what witnesses concluded was an attempt to arrest it. The van accelerated quickly again, and the inside of the driver’s door struck Hunke, knocking him to the pavement, badly injured. The van came to a stop on the opposite side of the street. Hunke was taken to the hospital, where he died two days later of blunt force trauma. Helen Goulet rescued Rose E. Downing from burning, Courtenay, British Columbia, January 25, 2015. Downing, 89, was in her one-story house after fire broke out in the living room and filled the structure with dense smoke. A friend, Goulet, 72, retired cashier, was in the house’s attached garage, which was at one end of the structure. Hearing a scream, she exited the garage to the outside and saw smoke issuing from the living room area, which was at the other end of the house. Goulet entered the house’s back door and was confronted by intense heat and a wall of black smoke. She closed her eyes, held her breath, and, following the sound of moaning, moved about 12 feet through the kitchen toward the fire. Goulet found Downing on the kitchen floor, face up, at the kitchen’s entrance to the open living and dining area. She grasped Downing’s arms near the shoulders and dragged her through the kitchen and to the back door and outside to safety. Both women required hospital treatment, Goulet suffering smoke inhalation. She recovered. The Gary Olson Family rescued a woman from assault, North Sioux City, South Dakota, May 10, 2014. A 38-year-old woman who was being threatened with a gun by her husband in a parking lot walked onto the adjacent highway and waved her arms. Inside the sedan that immediately stopped were Gary Olson, 64, off-duty deputy sheriff transporter; his wife, Mary, 54, medical biller, who was driving; and their daughter, Shelby, 20, college student, who was in the back seat. The woman approached them and asked for help, telling them that the assailant was going to kill her. Shelby opened the back door on the driver’s side for the woman, who then entered the car as Gary stepped from the front passenger seat and began to circle the vehicle. The assailant drove up in a pickup truck, stopped beside the car, and pointed the gun at the woman. When Gary then approached him and showed his deputy’s badge, telling him to leave, the assailant pointed the gun at Gary. Gary told Mary to drive off, and she did so, leaving him with the assailant. The assailant then turned his truck around and pursued the three women. The high-speed chase went through a residential neighborhood before both vehicles entered an interstate highway and reached speeds estimated by police at 100 m.p.h. During the pursuit, the assailant shot at the car at least three times, with one bullet penetrating it and striking Shelby in the lower back. Police by then had joined in the pursuit, and Mary exited the interstate at the scene, having made a five-mile loop. After his truck was disabled by police, the assailant was found inside, dead of self-inflicted gunshot. Shelby was taken to the hospital for treatment of her wound, from which she recovered. Peter Todd Radke died attempting to save Angel Rodgers from drowning, Bay Village, Ohio, May 31, 2014. Angel, 16, was in wadable water of Lake Erie not far off the beach when she was struck by a wave and pulled farther from shore. Rescue attempts were made by those at the scene, but rough water conditions, including four-foot-high waves, thwarted their efforts. Radke, 43, social media specialist, was in another party on the beach in the vicinity. He removed his shirt, entered the 61-degree water, and swam to Angel, reaching her at a point about 225 feet from shore. Radke grasped Angel and pushed her away from the rocks of a nearby jetty, but they were separated and submerged by a wave. Angel resurfaced and was carried away by the current. Radke also resurfaced but was then struck by another wave and submerged again. First responders removed Angel from the lake, and she was taken to the hospital for treatment. She recovered. Radke was removed from the lake about three hours later; he had drowned. Wayne L. Hoffman died attempting to save Evan A. Johnson from drowning, Tofte, Minnesota, December 23, 2014. Johnson, 40, called for help after entering the frigid water of Lake Superior from a rock ledge about six feet above the surface of the water. Walking nearby, Hoffman, 66, technical services director, responded to the ledge. Although five-foot waves were crashing against the shoreline and onto the ledge, Hoffman lay on the ledge and reached for Johnson but was pulled into the water. He and Johnson drifted from shore together as those responding to the scene repeatedly threw a life ring toward them. Separated, both men then floated face down in the water, the waves carrying Johnson back to shore at a point about 3,500 feet from where he entered. Others pulled him from the lake and attempted unsuccessfully to revive him. Hoffman drifted farther out and was recovered from the lake by the Coast Guard about seven hours later. He too had drowned. Michael Campanella and Adam Matthew Myers rescued a man from burning, Clifton Park, New York, August 8, 2014. A 54-year-old man remained in the driver’s seat of a station wagon that was aflame on the inside after the vehicle left the roadway and came to rest in mud at the edge of a pond. Driving their vehicles nearby, Campanella, 40, general contractor, and Myers, 21, graduate student, witnessed the accident and ran to the scene. They found flames virtually filling the vehicle’s passenger compartment, spreading toward its front end, and issuing from the partially opened window of the driver’s door. The driver’s hair and shirt were aflame. After the man was removed through the driver’s door to the mud beside the vehicle, Campanella and Myers, each grasping a wrist, dragged him a short distance to the pond. As Myers used mud and water to extinguish flames on the driver’s body and clothing, Campanella left the immediate scene to retrieve a bucket. Upon returning, he found that the driver was attempting to re-enter the burning vehicle, the inside of which was fully engulfed by flame. Campanella pushed him to the mud. First responders arrived and secured the man, who was then taken to the hospital. Medics at the scene treated Campanella and Myers, each of whom sustained minor burns to a hand. They recovered. Kevin Michael O’Connor saved a man from drowning, Geneva, Illinois, April 19, 2014. While kayaking, a man went over a low-head dam spanning the Fox River and was carried downstream by the swift current. O’Connor, 40, librarian, was in a park on the bank of the river about 250 feet downstream of the dam when he was alerted to the situation. He entered the 49-degree water and waded out to look for the man, having to go beneath a low bridge that blocked his view downstream. Clearing the bridge, he saw a life jacket being swept downstream about 150 feet ahead of him and then swam to it. Finding that the life jacket was attached loosely to the man, who was submerged, O’Connor lifted the man’s head to the surface of the water, grasped him under the arms, and swam him toward the bank, en route effecting attempts to get him to breathe. Those at the bank assisted in pulling the man from the water, and O’Connor exited to safety also. The man required hospital treatment, and O’Connor was tired after the rescue. He recovered. Laurence T. Norton III rescued a woman from assault, New Orleans, Louisiana, October 27, 2014. A 38-year-old woman screamed when a man with a large kitchen knife began stabbing her repeatedly in the parking lot of the office building where she worked. Alerted by his assistant to the attack, Norton, 47, a dentist whose office was in the building, responded to the scene, approaching the assailant from behind. He grasped the assailant’s shoulders and pulled him away from the woman. The assailant then knocked Norton to the pavement, dropping the knife as he too fell to the ground. As both the assailant and Norton were starting to regain their footing, the assailant pushed Norton to the pavement again and then fled from the scene. Norton assisted the woman into his office, where other personnel administered first aid while Norton guarded the door against any return of the assailant. The woman required hospitalization for treatment of her stab wounds, and Norton sustained scrapes to his arms and knees but did not need medical attention. He fully recovered. Clifford W. J. Peterson helped to save a man from falling, Toronto, Ontario, December 8, 2013. At night, a distressed 26-year-old man sat atop a bridge abutment at its outside edge, that point being about 100 feet above the floor of a wooded valley. On being alerted to his presence there, Peterson, 40, police constable, and his partner responded to the bridge deck at the abutment. As the concrete structure was six feet across and its top five feet above the level of the bridge deck, Peterson boosted himself up to the top of the abutment, which was covered with an inch of snow and ice. When the man then moved closer to the edge and pushed himself off, Peterson lunged across the abutment, grasped the man from behind, and, lying unsecured on his stomach, held the man against the outside face of the abutment. The man began to struggle against Peterson, pulling him partially off the abutment. Peterson’s partner had advanced on the deck to the abutment, grasped Peterson by the ankles and then the legs, and pulled on him as Peterson backed from the edge, dragging the man. Peterson and his partner took the man to the deck of the bridge and secured him. Peterson sustained scratches and bruises on his arms and legs but fully recovered. Fraser A. Potts helped to save a woman from drowning, Fairford, Manitoba, May 10, 2013. In a suicide attempt, a 22-year-old woman drove her car into the Fairford River. She exited the vehicle before it submerged and was then carried downstream by the swift current. On duty, Potts, 28, police officer, and his partner had responded to the scene. Potts ran along the bank after the woman and at a point opposite her entered the river for her, but he returned to the bank on encountering the river’s current and 37-degree water. Potts then continued along the bank following the woman, at one point wading through chest-deep water of a river inlet. He encouraged the woman to swim back to the bank, but to no effect, as the woman submerged as she continued downstream at about the center of the 300-foot-wide river. At a point about 1,200 feet from where the woman entered the river, Potts again waded in from the bank and, reaching his depth, swam to the woman and grasped her. He attempted to swim with her toward the bank as they were carried farther downstream, but he had difficulty moving his legs, as hypothermia was taking its effect. Potts’s partner and two other men responded in a small boat and reached Potts and the woman at a point about a mile downstream. By then, Potts and the woman were barely above the surface of the water, and Potts was almost completely immobilized. Those in the boat pulled them aboard, worked to warm them, and returned them to the bank. Potts and the woman were taken to the hospital for treatment of hypothermia, and they recovered. Jon Christopher Meis saved an indeterminate number of people from assault, Seattle, Washington, June 5, 2014. A man armed with a 12-gauge, double-barrel shotgun entered the lobby of a university classroom building after fatally wounding a man outside the building. He ordered those in the lobby not to move and then fired, striking a student in the arm. Meis, 22, college student, was working as a security monitor about 15 feet away, in an office adjacent to the building’s entry. When he saw what he concluded was the assailant reloading his gun, Meis approached him, from behind, with a container of pepper spray that he had taken from his backpack. Meis sprayed the assailant in the face with the pepper spray and then grasped his gun and took it away from him. After placing the gun in the security office, Meis again approached the assailant and took him to the floor, the assailant removing a sheathed knife from his person. The knife dropped to the floor, and Meis directed another student to remove it from the assailant’s reach. Meis and the other student then secured the assailant on the floor until police arrived shortly and arrested him. Meis received medical treatment for minor injuries, and he recovered. Steven A. Martin rescued Larina L. Hoppel from burning, Patton, Pennsylvania, September 6, 2014. Hoppel, 36, was the driver of a car that, in a highway accident, left the roadway and struck a wooden utility pole. The car came to rest on a grassy embankment, upright and against the pole. The top of the pole broke off in the accident, taking down wires, including a 12,470-volt line, and fell between the car and the base of the pole. Fire broke out immediately inside the car, burning Hoppel, who, trapped in the wreckage, screamed for help. Another motorist, Martin, 39, financial services associate, witnessed the accident. He ran to the driver’s side of the car and touched it lightly to see if it was energized. He then leaned toward Hoppel, who was reaching out through the broken windshield, and grasped her by the arms while avoiding the downed lines. Martin pulled on Hoppel, but without success, as he had insufficient leverage because of the car’s positioning. With Hoppel then grasping Martin around his neck, he moved backward, pulling her from the vehicle to the ground beside it. Martin and another man carried Hoppel to safety, after which flames grew on the car to engulf it, the downed lines sparking and popping. Hoppel was hospitalized for two months for treatment of severe burns. Martin was not injured. Neil C. Burkhardt rescued Allen H. Bricker from assault, Vancouver, Washington, February 4, 2014. Bricker, 45, was at work in a suite on the fourth floor of a four-story office building when a woman entered the premises and at close range fired a .38-caliber revolver three times at him, striking him twice in the back. The assailant followed Bricker as he fled through a hall. Burkhardt, 32, health systems specialist, was in a room at the end of the hall when he heard the shots. Seeing the assailant pursuing Bricker, Burkhardt ran after her and tackled her, taking them through an interior window in the hall as Bricker escaped to another part of the floor and collapsed. Burkhardt restrained the assailant until he secured possession of her gun, and then he held her at gunpoint until a security officer arrived and handcuffed her. Bricker was hospitalized 30 days for treatment of his gunshot wounds, and Burkhardt required overnight hospitalization for treatment, including surgery, of wounds to his right hand. He recovered. Matthew L. Tranel and Cory Alan Simonson saved Harvey L. Untiedt from burning, Maquoketa, Iowa, December 14, 2014. Untiedt, 48, who was confined to a wheelchair, was in his one-story house when fire broke out in the living room near the live Christmas tree. Blocked by deteriorating conditions from exiting the house by way of the accessible front door, Untiedt attempted to move toward a side door. A wheel that then malfunctioned on the chair stranded him between the living room and the kitchen as flames spread in the living room and smoke filled the house. Tranel, 39, loan officer, was en route to the fire station in response to the call as a volunteer firefighter when he came upon the scene. With flames visible to him through the living room window, Tranel went to the front door but found it locked. He responded to the enclosed side porch and forced entry, and then he broke open the door leading to the kitchen. Simonson, 29, production worker, had arrived from his nearby house by then, and both he and Tranel entered the house, going to the floor in the dense smoke. With little visibility, they crawled across the kitchen and found Untiedt. Then discovering that the wheelchair was immobile, they turned it around and maneuvered it through the kitchen to the side door. Others who had responded helped to remove Untiedt from the porch and to safety. Untiedt was taken to the hospital for treatment of smoke inhalation, and Simonson experienced respiratory problems from the smoke, but he fully recovered. Joshua J. Gardner saved a man from drowning, Calgary, Alberta, July 5, 2014. A man remained in the driver’s seat of a sport utility vehicle after it left the roadway and entered a pond on a golf course. Floating upright at a point about 90 feet from the closer bank, the vehicle started to submerge nose first. Gardner, 36, golf professional, was on the course not far from the pond and witnessed the accident. Seeing that the driver of the vehicle was dazed and making no effort to leave it, Gardner entered the pond fully clothed and swam to the vehicle’s driver’s side. Water by then had reached the bottom of the window of the driver’s door. Gardner reached through the partially opened window, opened it completely, and then released the man’s safety belt. Confused, the man moved into the front passenger seat. Gardner entered the vehicle farther, to his waist, and grasped the man under his arms. Pulling the man with him, Gardner backed through the window. He then assumed a hold on the man and swam to the bank with him. Unable to learn from the man if others remained in the vehicle, Gardner swam back to it, but it had submerged and Gardner could not see inside. He returned to the bank. The man required hospital treatment. Clifford A. Wright saved Patricia Cothern and Gildo V. DiLoreto from drowning, Sarasota, Florida, January 13, 2015. Cothern, 82, and DiLoreto, 86, were in the front seats of a sport utility vehicle that, in an accident, left the roadway, entered a pond, and started to sink in water about 12 feet deep at a point about 23 feet from the bank. Wright, 72, retired electrician, witnessed the accident from his nearby home. He immediately ran to the bank of the pond and, removing his shirt, entered the water and swam to the passenger side of the vehicle. Water by then was rushing into the car as Wright reached through the window of the front door, grasped Cothern under the arms, and pulled her out. She swam to the bank as Wright proceeded to the driver’s side of the vehicle. By then, water in the car had reached DiLoreto’s mouth. Wright reached through the window of the driver’s door, grasped DiLoreto under the arms, and pulled but succeeded in removing him only partially. Wright held DiLoreto at the surface of the water as the vehicle continued to sink, falling away from them. He then towed DiLoreto toward the bank, both of them submerging en route and were then assisted from the water. Neither Cothern nor DiLoreto was injured. Wright was nearly exhausted and suffered from chest pains for a few hours after the rescue, but he fully recovered. Stuart Chaffin saved John K. Kristich from burning, Orlando, Florida, December 22, 2014. Kristich, 50, was the driver of a car that, in a highway accident, collided with a truck occupied by three men. Both vehicles burst into flames, as the truck’s fuel tank was ruptured in the collision. Kristich remained in the driver’s seat of his badly damaged car as flames issued from its exposed engine area, and the men in the truck were able to escape that vehicle on their own. Another motorist, Chaffin, 45, asset protection manager, witnessed the accident and stopped at the scene. He ran to Kristich’s car and found Kristich unresponsive and his driver’s door jammed shut. Chaffin then opened the rear door on that side of the car and entered. Despite flames starting to enter the passenger compartment underneath and around the dashboard, he climbed partially over the front seat, dislodged Kristich, and pulled him into the back-seat area. Stepping from the car, Chaffin dragged Kristich out of the vehicle to the nearby median and then farther away, to safety. Chaffin returned toward the burning vehicles to find one of the men from the truck aflame. He held the man down in the median to roll him in the grass and pat out the fire on him. Kristich required hospital treatment for his injuries, as did Chaffin, who sustained burns, up to third-degree, to his hands and legs. The man from the truck whom Chaffin aided died four days later. Boyce Coleman and Jenna Fanelli saved Stephen Jones from drowning, Yonkers, New York, September 7, 2014. Stephen, 5, was seen floating away from the bank of the Hudson River while attending a community event at a municipal park. Alerted to the situation, Coleman, 43, delivery driver, who was attending the same event, climbed over a fence along the bank, descended to the level of the water, and entered the river. He swam to the boy, grasped him, and attempted to return to the bank with him against a swift tidal current. Others were entering the water in rescue attempts, including Fanelli, 23, recreational therapist, who swam out to them. Reaching them, Fanelli shouted for Coleman to give her the boy, as Coleman appeared to be struggling. Fanelli then wrapped an arm around the boy’s chest and used her free arm to swim toward the bank against the current, which carried them farther up the river. At the bank, she was helped in getting Stephen out of the water. Coleman continued to struggle, and he shortly submerged and was not seen alive again. A dive team recovered his body at a point about 50 feet from the bank, not far from where he was last seen. He had drowned. Stephen was not injured, and Fanelli was nearly exhausted and sustained some cuts to her feet. She recovered. William J. Driscoll stopped a runaway vehicle containing Jeffrey W. Finch, Lakeville, Massachusetts, September 15, 2014. Finch, 46, was driving a sport utility vehicle on a two-lane highway when the vehicle went into the opposing lane of traffic and continued, at a speed of about 45 m.p.h. Driscoll, 34, mortgage broker, was driving a pickup truck behind Finch. Thinking that Finch was distracted, he sped to a point alongside his vehicle and saw that Finch was slumped over. As other vehicles were approaching in Finch’s lane, Driscoll struck Finch’s vehicle with his pickup, taking it off the highway to the shoulder and stopping it against the guide rail. Driscoll then exited his truck and entered Finch’s vehicle and secured it. Finding Finch unresponsive, Driscoll attempted to revive him but was unsuccessful. Finch was taken to the hospital, where he was pronounced dead.